Purebred Highland Cattle are naturally lean and low in cholesterol. Because of their hairy coats, they don't have or need as much back fat as other breeds. Most Highland breeders raise their cattle naturally. Our animals are never given growth hormones, steroids or animal by-products. 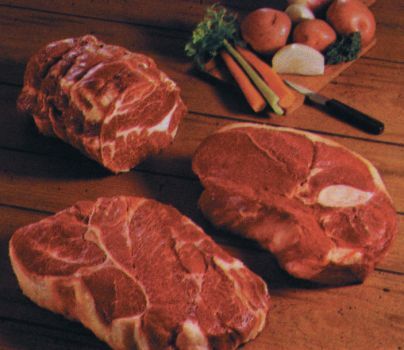 All of our beef is aged naturally and USDA inspected. Our beef is considered grass fed and grained finished. Purebred Large Black Hogs are known for the ability to thrive on pastures. The pork is darker in color and more flavorful than commercial breeds. The meat is lean yet micro-marbled with short muscle fibers that gives it tenderness. Our animals are never given growth hormones, steroids or animal by-products. All of our pork is USDA inspected and is considered grass fed and grained finished.